There were other problems – minor problems – that I found in these first four episodes. One episode featured Francis’ violent encounter with Verity’s wannabee suitor, Captain Blamey and the other, a fight between Ross and his future father-in-law, Tom Carne. And I thought Christopher Barry handled both scenes in a rather clumsy manner. Both situations seemed to be a case of“now you see it, now you don’t”. In Ross’ fight with Carne, the 17 year-old Demelza got into the melee (which did not happen in the novel), allowing her to spout some nonsense about women’s right in one of those “a woman’s travails” speeches that came off as . . . well, clumsy and contrived. 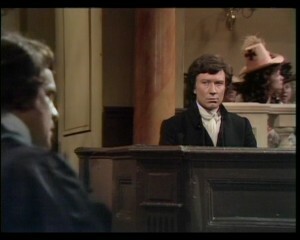 It did not help that actress Angharad Rees seemed to be screeching at the top of her voice at the time. In fact, screeching seemed to be the hallmark of Rees’ early portrayal of the adolescent Demelza in an emotional state. Some fans have waxed lyrical over Clive Francis’ portrayal of Francis Poldark. So far, I have yet to see what the big deal was about. Other than three scenes, Francis spent these first four episodes portraying a cold and rather aloof Francis. I found it difficult to get emotionally invested in the character. I have seen actor Robin Ellis in other movie and television productions, including 1971’s “SENSE AND SENSIBILITY” and 1981’s“THE GOOD SOLDIER”. If I were to pick his best roles, I would choose two – the passive aggressive American John Dowell in “THE GOOD SOLDIER” and of course, Ross Poldark. The producers of the series selected the right actor to portray the volatile war veteran-turned-mine owner from Graham’s saga. 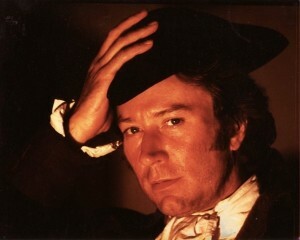 He is Ross Poldark . . . of the 1970s that is. Granted, Ellis had his moments of theatrical acting. There were times during the first four episodes in which I had to turn down my television volume. But despite this, I thought he did an excellent job in capturing all aspects – both good and bad – of his character’s personality. Two scenes featuring his performance caught my attention. Ellis seemed a bit scary and intense when he expressed Ross’ reaction to being rejected by Elizabeth Chynoweth in Episode One. And I thought he gave a poignant performance in the scene that featured Demelza’s seduction of Ross.